Nature's Menu Country Hunter wet food is a complete and nutritionally balanced diet for dogs. A complete and balanced meal with deliciously meaty cuts of Pheasant and Goose and a wholesome blend of red berries, nutritious pumpkin seeds and autumnal vegetables. 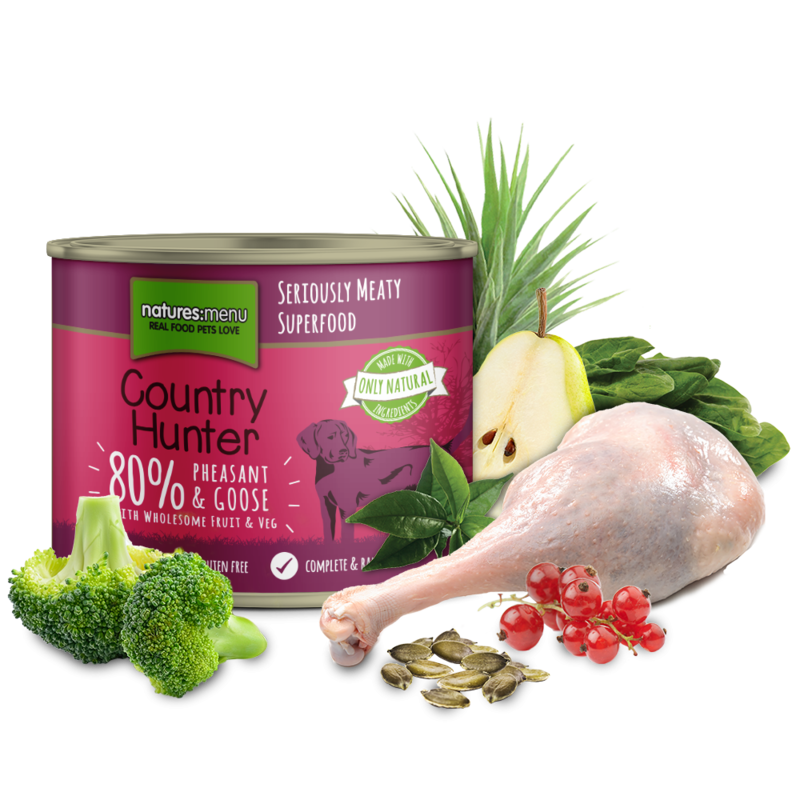 The Country Hunter canned meals for dogs from Nature's Menu are filled with top quality raw ingredients, sealed and then gently cooked to lock in goodness. Packed with ethically sourced, human grade meats, fruit and veg plus essential vitamins and minerals. Grain and gluten free. Contains no meat meals or derivatives, artificial colours or flavourings. Nature's Menu only use quality, human grade meats in their natural pet foods, and absolutely no meat meals or meat derivatives. All Country Hunter complete and balanced meals are veterinary approved and made to FEDIAF guidelines. 40% Pheasant, 40% Goose, 4% Redcurrant, 3.5% Pears, 3% Pumpkin Seeds, 3% Butternut Squash, Broccoli (3%), Cod Liver Oil (1.5%), Kelp (0.7%), Spinach (0.7%), Green Tea Extract (0.6%).